Do you ever have those days when you feel like you've been working all day but didn't get anything accomplished? Those are usually my days when I spend hours a little while browsing the black hole of the universe Pinterest! We love Chicken Parmesan. This recipe intrigued me because is a meatloaf really going to taste like chicken that's been breaded then fried in oil and smothered in rich marinara topped with ooey gooey cheesy goodness? I changed the chicken to turkey because I was improvising and that's what I had on hand. I added a little more marinara and some spices and the end result was a meatloaf that tasted like our favorite Chicken Parmesan from our favorite restaurant. Preheat oven to 350 degrees. Spray a loaf or meatloaf pan with cooking spray and set aside. Set aside the Italian cheese and the marinara sauce. In a large bowl combine the rest of the ingredients and using light fingers or a wooden spoon mix the ingredients until combined. I always use clean hands when mixing any type of meatloaf. Add 1/2 cup of the marinara or pasta sauce and mix lightly. 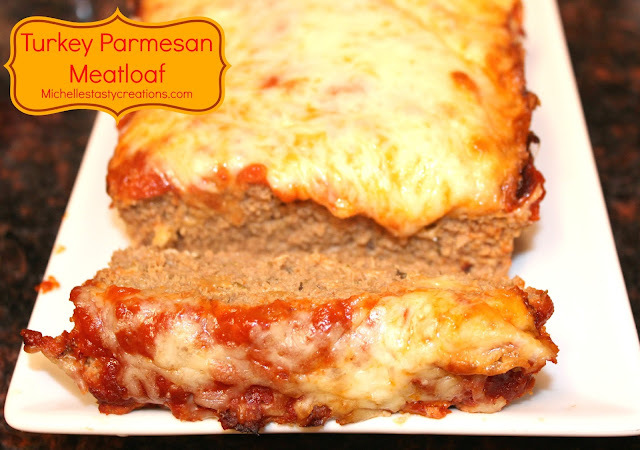 Pour into the greased loaf or meatloaf pan and top with the remaining 1/2 cup of marinara sauce. Bake for 50-55 minutes then add the Italian shredded cheese blend and bake for an additional 10 minutes or until golden brown and bubbly. The pictures aren't the best because we were HUNGRY and it smelled A-MAZ-ING! Michelle, I've never visited your blog before, but wow did I pick the right day to discover it! That recipe looks amazing!